A new “must have” app has found its way to Android users. This app isn’t the latest game, entertainment or productivity app, but is a device manager tool that allows users to locate their lost or stolen devices. Information about the app is detailed on Android’s Google+ page and the app itself is available on Google Play. While it is quick and easy to set it up on all of your Android devices, it is one of those apps you hope you never have to use. If you do misplace a device, however, you can use another Android device to locate the lost hardware. This means if your phone goes missing, you can use your tablet to lock the screen, set the phone to ring at its highest volume for five minutes, and also show you on a map where your phone is located. While this app may help in locating a misplaced or hijacked device, users must have more than one Android device on hand to make it work. “It’s one app we hope you’ll never have to use, but at least now you have the peace of mind if you find yourself in a bind,” Android said on its Google+ page. 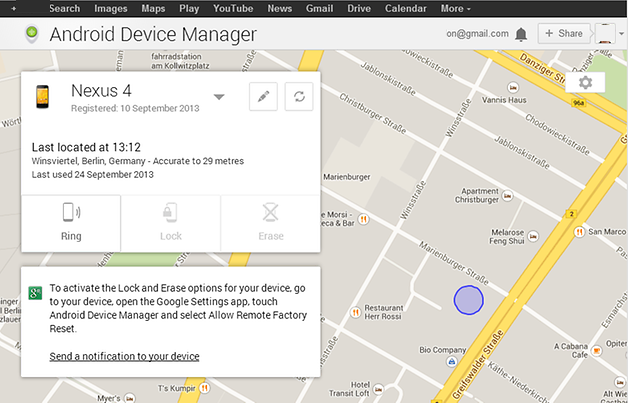 The Android Device Manager app is a follow-up to the browser-based locator Google released in August, ZDNet reports. The browser version allows users to track lost or stolen devices from a computer. While the web-based version is still available, ZDNet’s Liam Tung tested the app and said it felt more responsive than the web interface. The app makes it easier to locate your lost device and take measures such as locking the screen and sounding the ringer. It also allows users to take more immediate action, in most cases. “The app is particularly useful if you’re out and about and don’t have access to a computer,” the Google+ Android page entry said. The Android Device Manager app is comparable to Apple’s Find My iPad app. The Find My iPad app is a default app on most newer iOS devices, and locates iOS devices registered to the same user. The tool has been used to find devices that are lost, even under the same roof. In the next few years smartphone subscriptions are expected to continue to grow. A report released by Ericsson forecasts subscriptions will triple by 2019. Apple is also giving way to Android in the tablet category, according to an IDC report released earlier this year. With the number of devices on the rise, it has become necessary for Google to address this issue for its Android platform. It also addresses a trend where smartphone theft is on the rise. Handset manufacturers and carriers are working together to create options to deter theft, however measures need to be available when a device is stolen. An app such as the Android Device Manager makes it easy for “Good Samaritans” who want to find the owner and contact them to make arrangements to return the device.